Calendar contains 13 original multi-colour serigraphs (silkscreens) on medium-weight paper, not numbered, of unknown limited edition. Most colour images fill the sheet, some have white margins. In lower right of each image plate: plate-signed by artist. 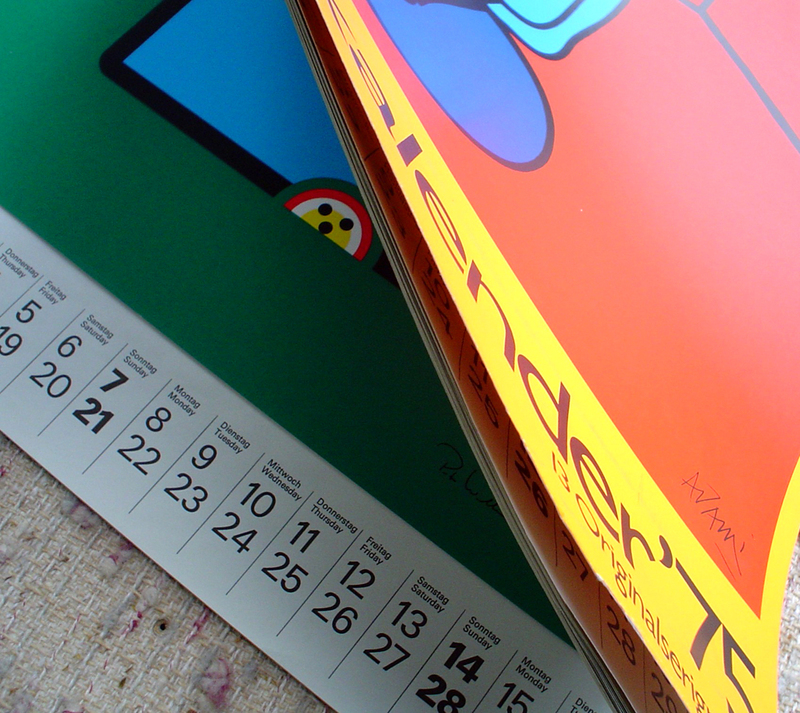 The calendar is bound with tiny perforations across the top to allow each serigraph to be easily removed for framing. Each serigraph is accompanied by Biography of Artist on a separate sheet. Completely intact, this is an oversize calendar titled "Künstlerkalendar '75", published 1975 by Bruckmann München and containing "13 Originalserigraphien" (ie. 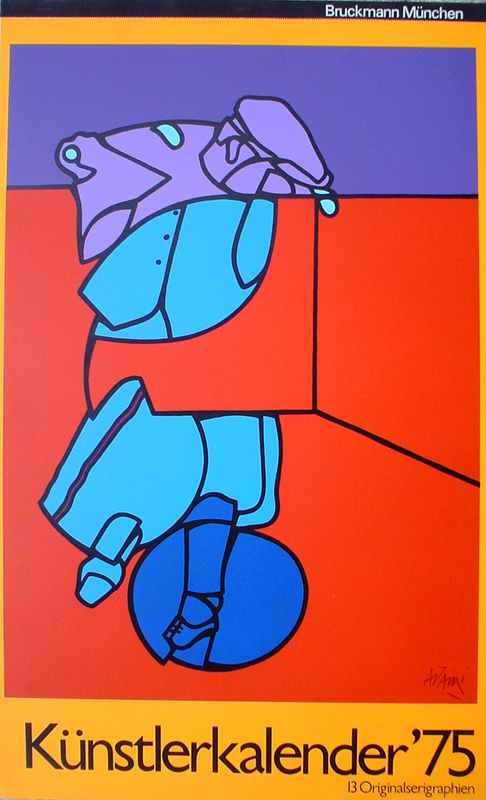 13 original serigraphs/ silkscreens) from thirteen leading European artists contemporary to that time. Featured artists (in order): Valerio Adami, Bernhard Müller-Feyen, Jo Adolf Nyfeler, Peter Bradtke, Roman Haller, Hannsjörg Voth, Karl Georg Schmidt, Erich Lethgau, Fritz Ruoff, Bettina von Arnim, Theo Braun, Horst Rave, Peter Wilhelm. 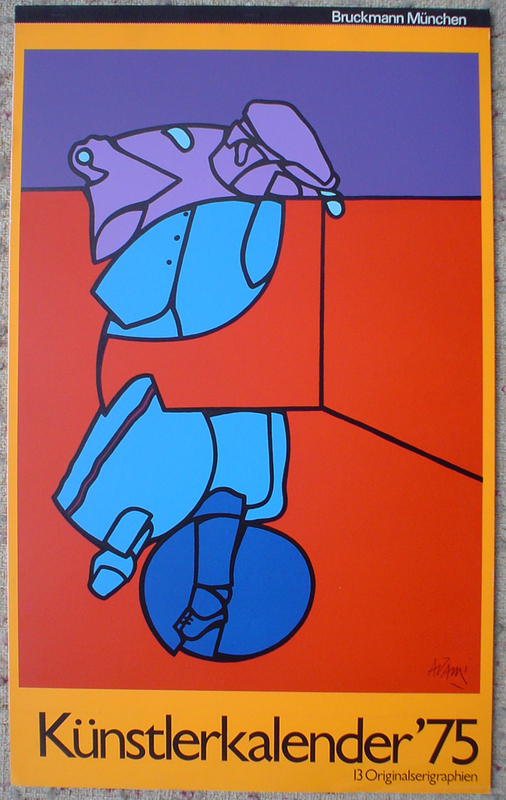 Serigraphs are also available individually. To view, use the Search Bar and enter artist first or last name. Or, see bottom of this web and click on the red link for "Calendar" in category "by Art Medium".